The 2012 Make-Yer-Own Oscar Pool Page is live. Per tradition there has been exactly zero user testing, so let me know if you encounter bugs, typos, or miscellaneous weirdness. Over at Que Sera Sera, Sarah Brown has a post about the misconceptions that people (including myself) had as children. Be sure to read through the comments, which include such gems as, “My husband believed (still believes?) that limes are unripened lemons”. Also in the comments are a few instances of readers coming to shocking realizations, such as the woman who discovers that her long-held belief that Alaska is an island (because of its placement on US maps) is erroneous. That reminded me of an incident in my late 20s. 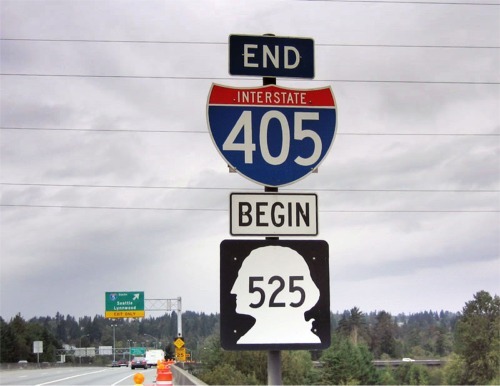 I had lived in Washington State nearly all of my life, and driven its roads innumerable times. One afternoon I was driving home from the airport, having picked up a friend who was making her first visit to the state. “I love your State Highway signs,” my friend remarked as we passed one. I thought this was an odd thing to find charming, and asked her to clarify. “I like how the number is printed on a silhouette of George Washington,” she replied. I had no idea what she was talking about. It wasn’t until we approached another of the black and white signs that I could validate her observation.